TK (Thomas Kelly) Webb was born and raised in Kansas City, Missouri and began his musical journey around the age of 9 when he picked up his first guitar. By the age of thirteen, he had already played in a bunch of punk rock bands around town and continued honing his playing throughout the 90s. In 1999, TK made the decision to relocate to Brooklyn, NY, where he built a loyal following through his live performances, which ranged from blues-soaked acoustic shows to spaced out, feedback jams. One thing that became clear was that TK was a truly gifted player, capable of producing some startlingly convincing Delta Blues. Following the release of TK Webb’s second solo LP, Phantom Parade (Social Registry, 2006), dubbed by Rolling Stone Magazine as a four-star, “oddly gripping” effort, it was evident that Webb’s songwriting was beginning to outgrow the sound that had peppered his solo efforts. 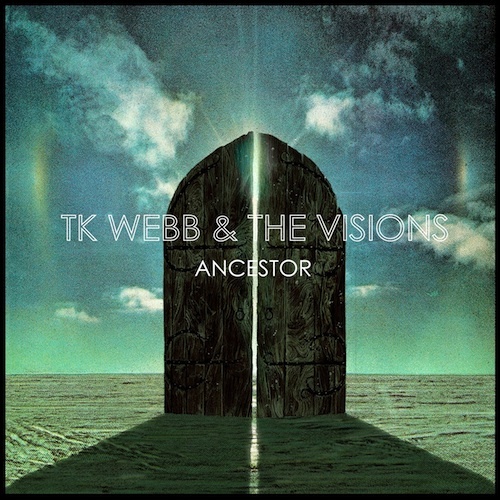 The new songs that would go on to comprise the Ancestor record referenced the rock music that Webb had grown up on. This sparked his decision to form The Visions in the summer of 2007. Joining Webb in the new band on second guitar is Brian Hale (ex-Love As Laughter), who had previously been accompanying Webb on bass following the release of Phantom Parade, Ben McConnell (Phosphorescent) on drums, and Jordan Gable rounding out the line up on bass. This new cast helps take TK’s acoustic visions and plugs them in through the Marshall, making for a heavier, more cohesive listen than Webb’s previous work. Produced by Matt Boynton at his Vacation Islands Studios in Brooklyn, Ancestor speaks of modern day paranoia, love, and a host of other human emotions many of us face in our day-to-day, making for not only an amazingly heavy, but also a sincerely beautiful recording.